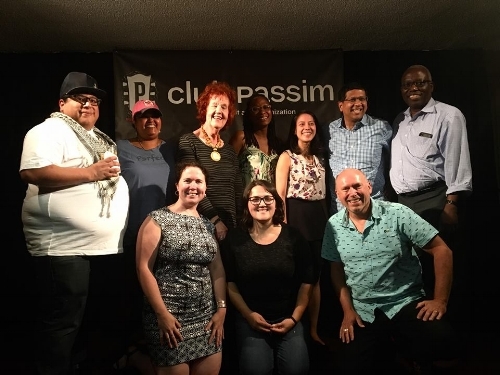 On July 16th, graduates of Massmouth’s first advanced storytelling class took the stage at Club Passim in Harvard Square, Cambridge to share personal stories inspired by childhood. Board member and host Dan Dahari reminded the audience of the recently-closed Toys “R” Us stores, and his favorite memories of selecting just the right action figure as a child. Like Dan, the graduates had similar nostalgic, and some tragic, memories from childhood that they presented in seven minutes. Ajay Gallewale and Erin Kane bookended the night with their childhood sports stories about praying to the baseball gods and throwing a game-winning touchdown, respectively. For Ajay, it was his first time performing in front of an audience, while Erin had participated in Massmouth's introductory class a month earlier. The tellers were as diverse as their stories. Eritrea-born Awet Teame described how her years growing up in a war-torn country prepared her for future challenges, while Toki Shih-Yi from Taiwan recalled memorable entrances to the U.S. at Logan airport. Other tellers honored lost loved ones. Tom Ostberg highlighted how some friends stay with us forever, while Mercia Tapping told a stirring piece on how news about her mother late in life changed her perspective on their relationships forever. Yolanda McLean brought the audience to tears as she shared how an instantaneous act of bravery when she was little led her to becoming the woman she is today. The courageousness of the storytellers to open up on stage (some for the first time) to talk about defining moments in their life was inspiring. The audience even experienced a Massmouth first. When Harold could not tell his story because of unexpected dental work earlier in the day, Massmouth played a pre-recorded audio about how dressing up as Santa for a work party taught him to be his best self. Like the tellers, many audience members discovered Massmouth and the venue for the first time, and Dahari encouraged them to return, possibly to become storytellers themselves. Massmouth will be hosting a Storytelling for Television workshop on Saturday, July 28 and August 25, as well as an Introduction to Storytelling class every Monday from August 6 – August 20. For those who want to become the next advanced storytellers, Massmouth’s second Advanced Storytelling workshop series will begin on Tuesday, September 4 and run the following two Mondays.